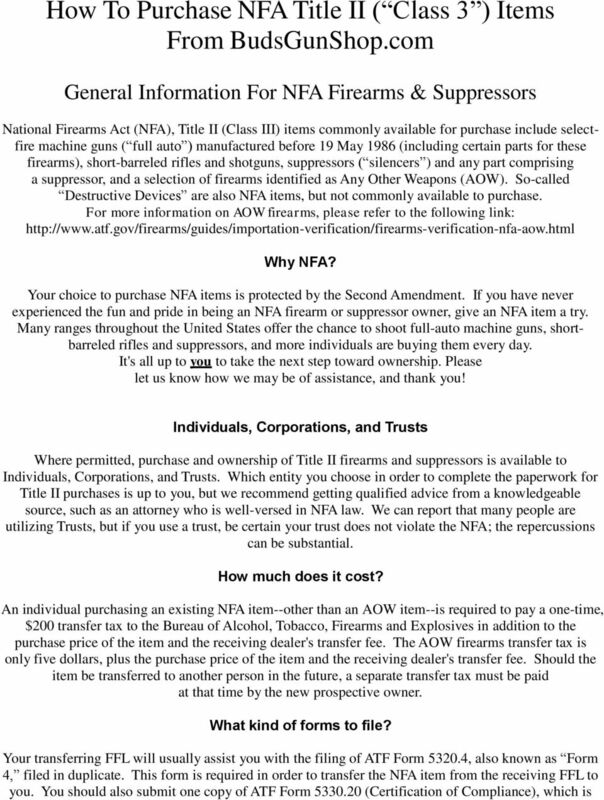 Download "How To Purchase NFA Title II ( Class 3 ) Items From BudsGunShop.com"
2 used to certify U.S. Citizenship. If you are filing within a trust, a copy of the trust goes along with the forms. How long is the wait? Wait time for ATF approval of the forms varies from as little as twelve weeks to several months. Currently, wait time is averaging a little over six months. Purchasing a National Firearms Act (NFA) Title II firearm or suppressor online from BudsGunShop.com is really, very easy! Barring certain federal, state or local prohibitions, an individual who is at least 21 years of age and currently able to purchase and possess any non-nfa firearm will also be eligible to purchase an NFA firearm from an NFA dealer. You need only provide us with three things to complete an NFA item purchase online: 1. Payment: You pay us for the firearm or suppressor in full at time of order (there are no layaway purchase plans for NFA items). 2. Federal Firearms License (FFL) & Special Occupational Tax License (SOT): We must ship a Title II firearm or suppressor directly to your receiving FFL, so we require a copy of the receiving dealer's FFL and a copy of their SOT. Prior to ordering from us, arrange transfer and shipment with your receiving dealer: 1. Find a licensed Class III FFL dealer in your area (sometimes called NFA Dealer ). 2. Contact the dealer and let them know you would like to receive a Title II firearm or suppressor for transfer from Budsgunshop.com. 3. Be sure to ask about their transfer fee for your NFA item (typically $50-$100). 4. If you agree to their fee, arrange the transfer with your NFA dealer (we do not arrange the transfer). 5. Provide your receiving dealer with our contact information so that the receiving dealer can send us a copy of their FFL & SOT (if not already on file with us). 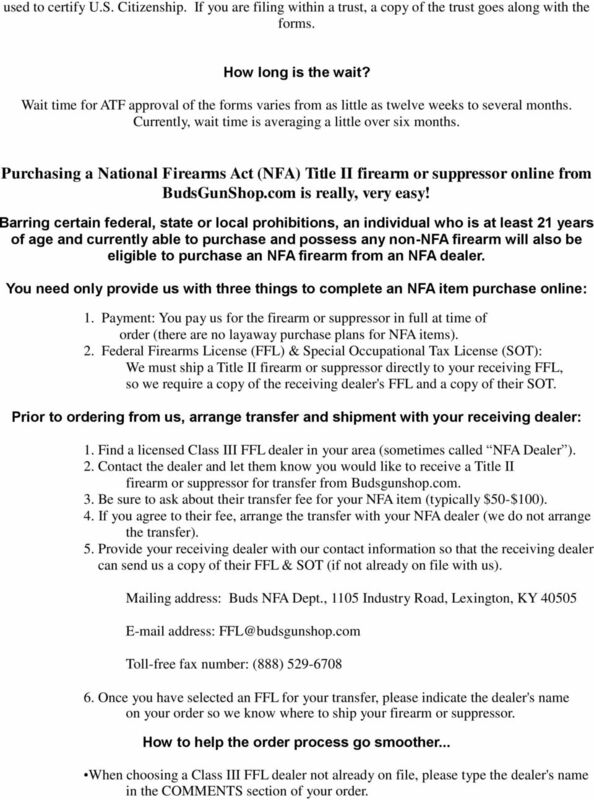 Mailing address: Buds NFA Dept., 1105 Industry Road, Lexington, KY address: Toll-free fax number: (888) Once you have selected an FFL for your transfer, please indicate the dealer's name on your order so we know where to ship your firearm or suppressor. How to help the order process go smoother... When choosing a Class III FFL dealer not already on file, please type the dealer's name in the COMMENTS section of your order. 3 Please include your ORDER NUMBER on any correspondence you or your Class III FFL may send us. It is recommended to locate a Class III FFL dealer to transfer your gun before you place your order. --VERY IMPORTANT-- Once the firearm or suppressor is received by your Class III FFL, Please INSPECT THE FIREARM/SUPPRESSOR THOROUGHLY to make sure that there are no defects with the firearm or suppressor. If there are any problems whatsoever, DO NOT FILL OUT FORM 4! Notify us and we will gladly have the firearm or suppressor picked up and returned to us. Once you fill out the Form 4, the firearm or suppressor is considered used and must be returned directly to the manufacturer for warranty repair or replacement. Budsgunshop.com will not accept any returned NFA firearms or suppressors for any reason, other than a manufacturer's defect. There is a 20% restocking fee on any returned NFA firearm or suppressor that is illegal in your state, or if you are prohibited to own an NFA firearm or suppressor. --NO EXCEPTIONS-- The information on this page is for reference purposes only and not intended to be used as legal advice. Some states permit all types of NFA items, other states permit only certain types, and a few states do not permit NFA firearms or suppressors. 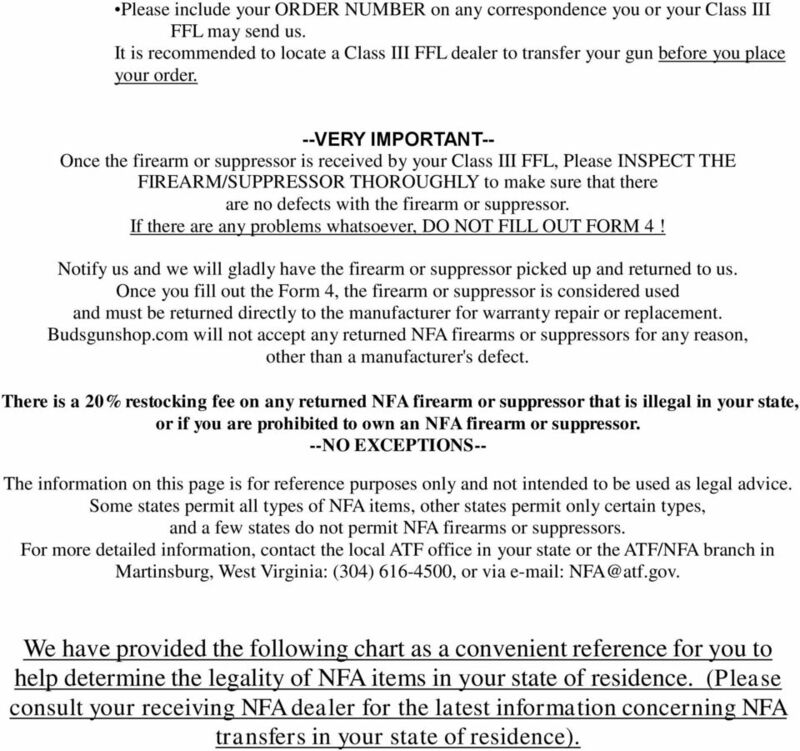 For more detailed information, contact the local ATF office in your state or the ATF/NFA branch in Martinsburg, West Virginia: (304) , or via We have provided the following chart as a convenient reference for you to help determine the legality of NFA items in your state of residence. (Please consult your receiving NFA dealer for the latest information concerning NFA transfers in your state of residence). 4 NFA Guidelines What is legal to own in your state? Legal To Own In Your State Not Legal To Own In Your State Caution Restrictions May Apply STATE MACHINE GUN SUPPRESSOR SBR SBS AOW Alabama YES YES NO NO YES Alaska YES YES YES YES YES Arizona YES YES YES YES YES Arkansas YES YES YES YES YES California YES NO YES YES YES Colorado YES YES YES YES YES Connecticut YES YES YES YES YES NOTES State registration pistol cal mg's over.30 cal RARELY ISSUED BY STATE DEPT OF JUSTICE. State permit required. Some areas may have restrictions. No selective fire machine guns, full auto only. Delaware NO NO YES NO YES No smooth bore AOW's Dist. Of Columbia NO NO NO NO NO Florida YES YES YES YES YES Georgia YES YES YES YES YES Hawaii NO NO NO NO NO Idaho YES YES YES YES YES Illinois NO NO NO NO YES Indiana YES YES YES NO YES Iowa NO YES YES YES YES Kansas YES YES YES YES YES Local regulations vary within the state. C&R's designated by Commander of Public Safety. 5 Kentucky YES YES YES YES YES Louisiana YES YES YES YES YES Typically, C&R mg's only. 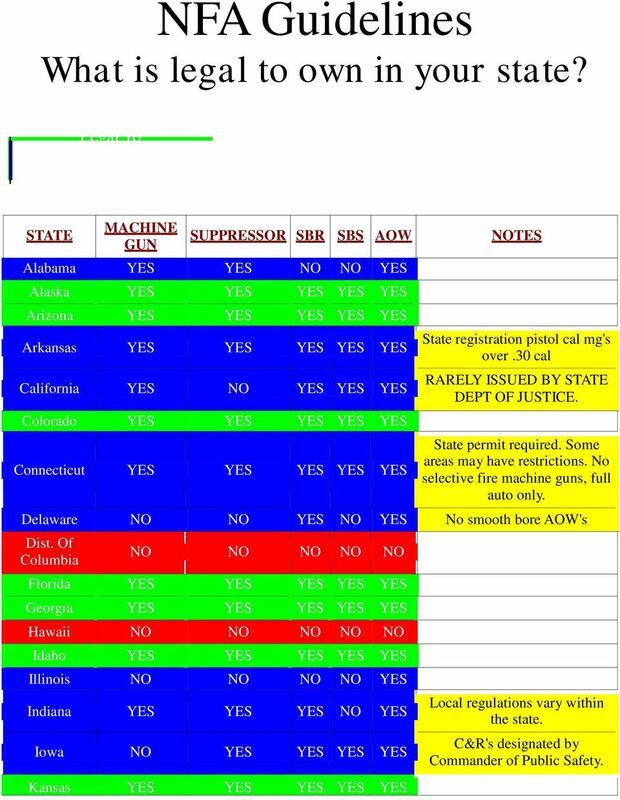 Maine YES YES YES YES YES Maryland YES YES YES YES YES Mg's must be registered with state. No hi-cap magazines. 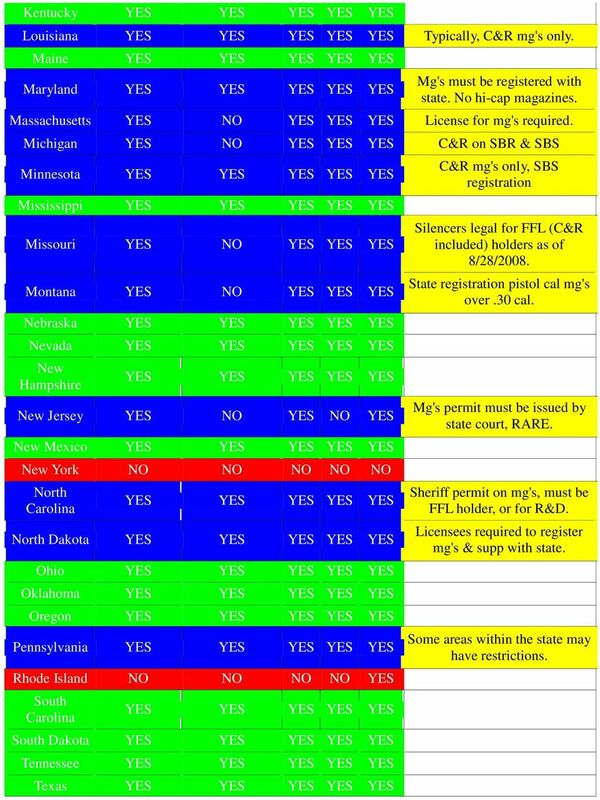 Massachusetts YES NO YES YES YES License for mg's required. Michigan YES NO YES YES YES C&R on SBR & SBS Minnesota YES YES YES YES YES Mississippi YES YES YES YES YES Missouri YES NO YES YES YES Montana YES NO YES YES YES Nebraska YES YES YES YES YES Nevada YES YES YES YES YES New Hampshire YES YES YES YES YES New Jersey YES NO YES NO YES New Mexico YES YES YES YES YES New York NO NO NO NO NO North Carolina YES YES YES YES YES North Dakota YES YES YES YES YES Ohio YES YES YES YES YES Oklahoma YES YES YES YES YES Oregon YES YES YES YES YES Pennsylvania YES YES YES YES YES Rhode Island NO NO NO NO YES South Carolina YES YES YES YES YES South Dakota YES YES YES YES YES Tennessee YES YES YES YES YES Texas YES YES YES YES YES C&R mg's only, SBS registration Silencers legal for FFL (C&R included) holders as of 8/28/2008. State registration pistol cal mg's over.30 cal. Mg's permit must be issued by state court, RARE. Sheriff permit on mg's, must be FFL holder, or for R&D. Licensees required to register mg's & supp with state. Some areas within the state may have restrictions. NAIC Annuity Suitability Requirements by Specific Alabama Alaska 10/16/2011 TBD Arizona Arkansas If you obtained a life insurance license prior to 10/16/11, you must complete the NAIC course by 4/16/12. We do require the name and mailing address of each person forming the LLC. FELONY DUI SYNOPSIS. 46 states have felony DUI. Charts 1 and 2 detail the felony threshold for each of the 46 states analyzed. SECTION 109 HOST STATE LOAN-TO-DEPOSIT RATIOS. or branches outside of its home state primarily for the purpose of deposit production. Please contact test@test.com if you have any questions regarding this survey. Who May Adopt, Be Adopted, or Place a Child for Adoption?